​As the pilgrims left Britain and Europe, crossing the Atlantic en mass in search of the promised land, they brought with them, along with anything else they could carry, their sports and pastimes. Both soccer and rugby were two of these, and are largely seen as the two games that gave birth to the gridiron, and in turn the NFL. Soccer eventually gave way to the greater influence and altogether more robustness of rugby as the nineteenth century plodded on. The early years of the gridiron were far from what we enjoy today. However it is not as simple as being able to state that American Football is an American variation on rugby. In most cases, the first ‘gridiron’ games were actually more akin to soccer matches with either no, or minimal handling of the ball being allowed. These early games however on the new trodden soil of the United States made way for viscous ‘tackling’ techniques and so the comparison with rugby is firmly established. It should be remembered though that even the most early forms of soccer in Great Britain in the 1600s were based more on ‘man-handling’ the opponent as opposed to obtaining the ball. 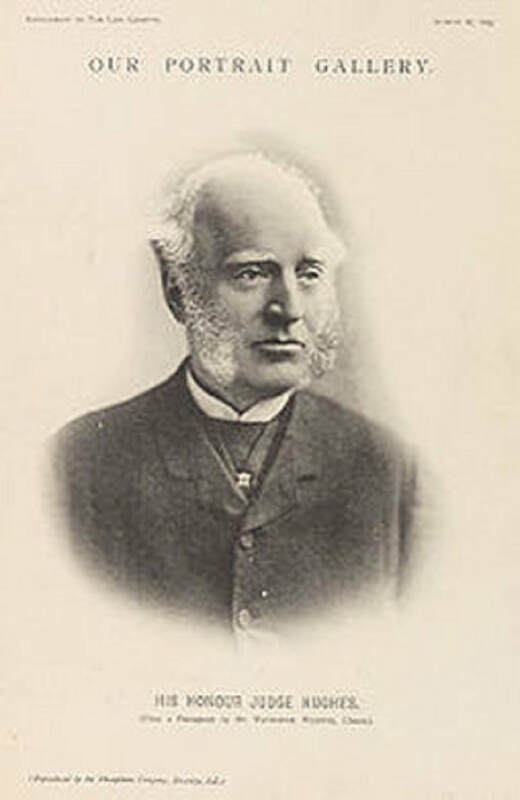 Some people even go as far as to site the author, Thomas Hughes, as one of the primary contributors to the eventual birth of a game that even slightly resembled American Football. 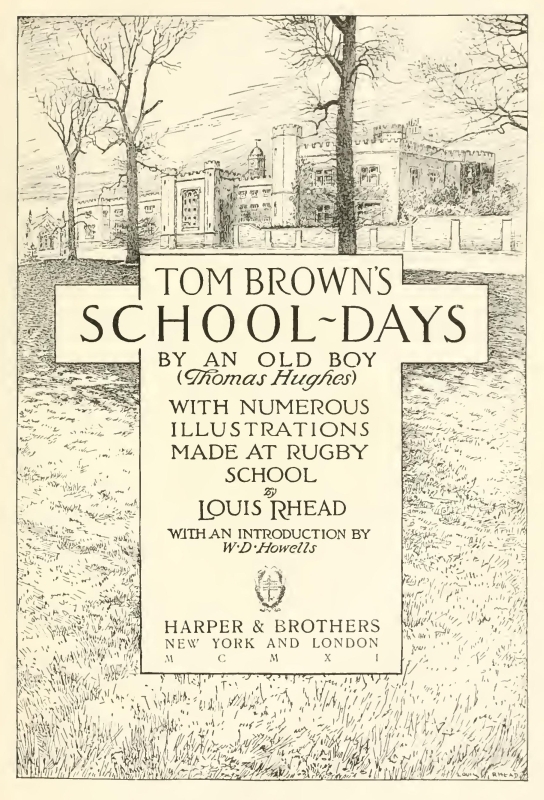 It is said that Hughes’ promotional tour of American colleges concerning his book Tom Brown’s Schooldays (a fictional story about Rugby School in England) had captured the American public’s imagination. Some even claim that Hughes had taken an oval ball on the tour with him for authenticity. There seems to be no absolute proof to confirm nor deny this, and as most beginnings to anything, the story becomes fact surrounded by legend. Did this book plant the seed of what would become, American Football? Whether Hughes’ exploits were true or not, in 1867, Princeton college set up the first rules on record. Two years later on November 6th 1869, the first college game took place when Princeton took on Rutgers in a contest that the latter won, 6-4. The game itself was again more akin to a disorganised seventeenth century soccer match, with each side boasting no less than twenty-five players. The sport continued to develop throughout the 1870’s, although the showdowns continued to resemble chaotic group ‘beat-ups’ as opposed to the gridiron match-ups that we enjoy today. One major change that began to alter the game into the format we now know occurred on May 15th 1874 (other sources state the year was 1876). Before a contest between McGill university (who actually hailed from Montreal) and Harvard - in which teams traditionally fielded fifteen players each - four of the McGill players fell ill. Instead of postponing the game, each side agreed to play the match with only eleven players. The number became standard soon after. 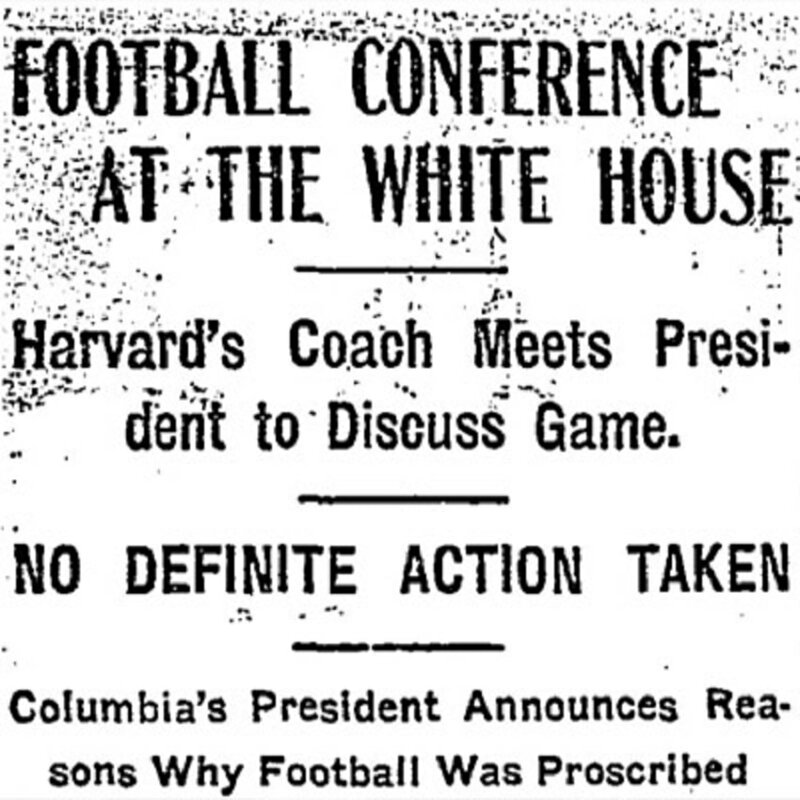 In fact, the game had been such a success that many colleges soon followed Harvard’s rules. Harvard had been one of the first colleges to allow an altogether more liberated approach to the carrying and running of the ball. Most colleges had snubbed this approach to the game initially and some referred to this style of play as 'The Boston Game'. It was, in all likelihood, this type of treatment from other colleges that led to McGill University being invited down across the border to play Harvard in the first place. In reality, McGill were probably closer to a Canadian rugby team than an American Football team. ​By the end of 1876 though, the five main colleges met and drew up rules for the first known intercollegiate league. These rules were based mainly on Harvard’s ideology of the game. The colleges themselves were known collectively as the Intercollegiate Football Association. 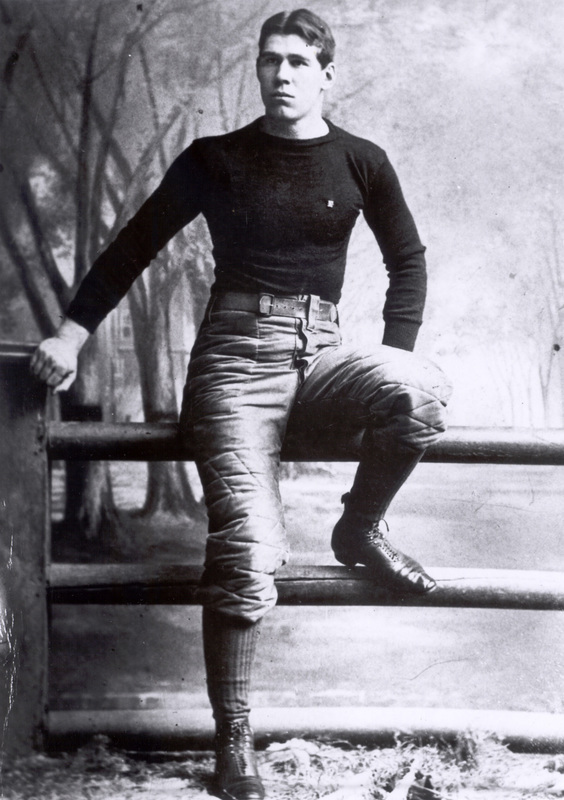 Walter Camp is to many the father of the game that would become, professional football. 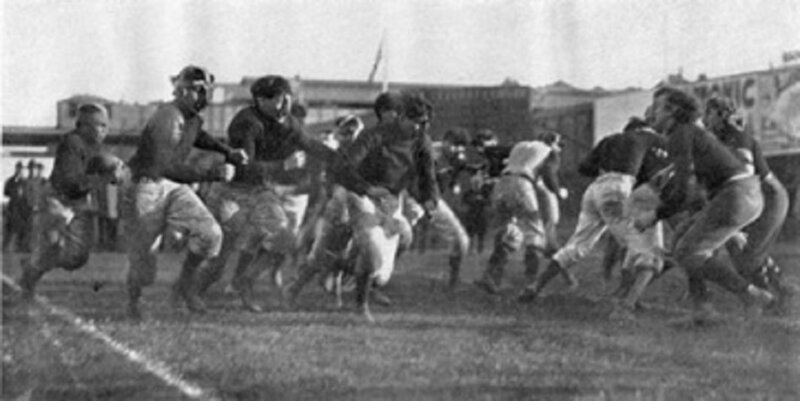 In 1880, Walter Camp of Yale University - named by some as the ’Father of American Football’ - introduced what became known as the ’line of scrimmage’, an imaginary line running across the field where each play would begin and progress would be tracked from. Yard markers and lines stretching the length of the pitch every five yards were also marked on the field itself, so giving it the look of a gridiron and consequently giving birth to it’s now infamous nickname. All these things devised by Camp went to making American Football more organised and less resembling a ’free-for-all’ scrap in the mud as many games of the era did. ​Another seemingly main contributor in the shaping of American Football - at a time when play was still restricted to colleges, predominantly in the north-north east areas of the United States - was Amos Alonzo Stagg. Stagg is said to have been of a very creative mindset and introduced many things that are still present in the modern game today. Such concepts as the huddle, the center snap, reverses, and diagrammed playbooks all hail from Stagg. He is even said to have suggested putting numbers on the player’s uniforms, and invented basic tackling dummies for practices by sewing gymnasium mattresses together. Despite this however, playing American Football was still extremely dangerous, and there was very little by way of the protective clothing, padding, and helmets of the like that players adorn today. It was commonplace for participants to be carried off with nasty, gruesome injuries. Some players even lost their lives such was the violent nature of the game. 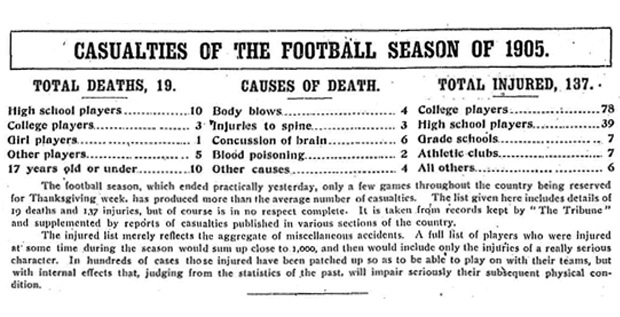 In 1905 alone, there were eighteen recorded deaths of college players and a further one-hundred and fifty-nine injuries of a serious nature. Because of the savagery that appeared to be taking over the game, President Roosevelt is said to have promised he would “see that football is ended” if the violence was not drastically toned down. 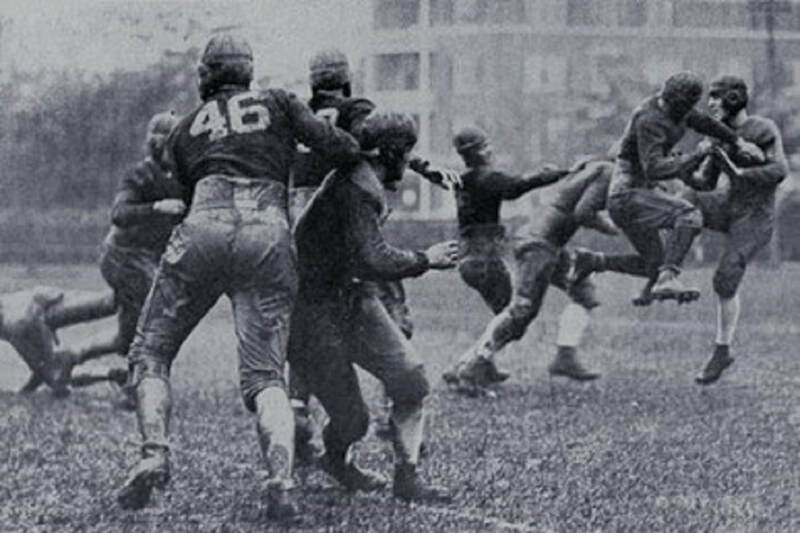 Roosevelt called the leaders of the college game to the White House itself; the order being to draft a new set of rules with the main idea being to avoid such injuries. Arguably the most revolutionary of these was the introduction of the forward pass. Not only did this drastically alter the game, as well as almost entirely distancing itself from rugby, but it also gave birth to the most well-known position of the team, the quarterback. While the game was predominantly restricted to colleges in the nineteenth and early twentieth century, by 1920 a professional league - the American Professional Football Association (APFA) - was formed. Professional teams had existed throughout the late nineteenth and early twentieth century, but they lacked any real organisation. Players would constantly flit from team to team, while teams themselves would be in existence one minute and simply gone the next. ​In fact it is agreed by most that the first professional footballer, in that he got paid a handsome amount of money for one game was, Pudge Heffelfinger, who way back in 1892 received $500 to suit up for the Allegheny Athletic Association. 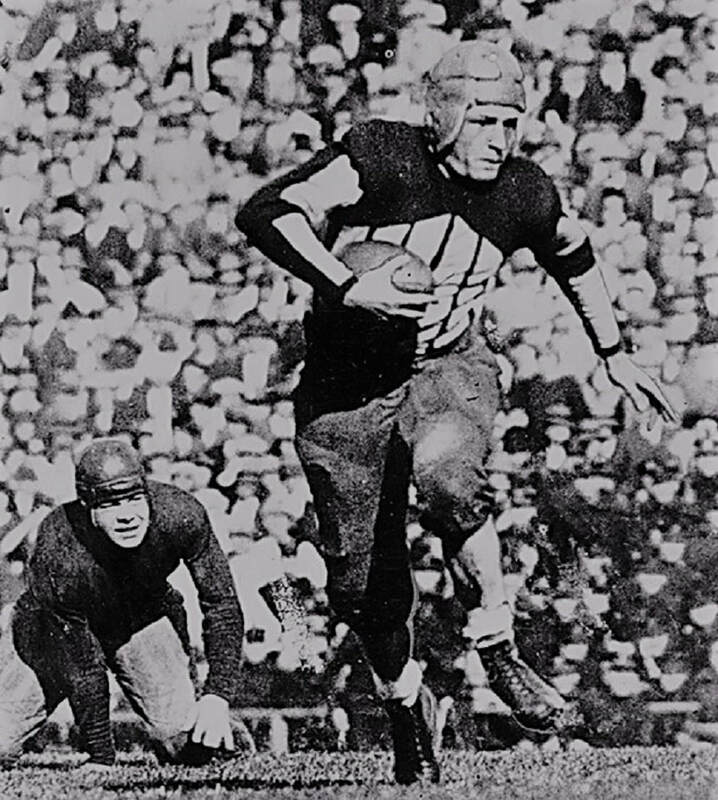 Heffelfinger turned out to be worthy of the title of ‘professional’ (at least in terms of dollar-for-ability exchange) as he knocked the ball loose of the opposing team’s player in one motion, before scooping it up and heading for the end-zone with the next for the only score of the contest as his side won 4-0. ​By the mid-1890’s many professional clubs existed, with the average wage being around $10 a game per player. In reality however, many of the players were workers on factory owned, sponsored teams. Consequently the vast majority of these professional teams were concentrated in and around the industrial north east of the United States (particularly the ‘steel belts’ of Pennsylvania), and to a slightly lesser extent the mid-north of United States around Illinois and Wisconsin. For the factory owner, it gave his workers extra money and recreation over the weekend. Because of their need (in many cases) to work in the factories themselves on a Saturday though, games were more often than not played on a Sunday. Despite there being no ‘league’ as such, professional football continued to grow, if only steadily. By the early twentieth century many baseball teams were beginning to finance and operate their own football teams. It was seen as a good way of keeping their players occupied and in-shape during the winter months throughout baseball’s off-season. Professional football was almost stopped before it began with the 1905 Canton-Massillon scandal! ​However the lack of any governing body to run the teams meant that something akin to chaos soon ruled professional football. Players would often use different alias to play on different teams, often several times in one season. Scandals were also rumoured regularly, but the one proven affair almost halted the growth of professional football in its tracks. When the Massillon Tigers and the Canton Bulldogs met in a two-game series, the eventual outcome was that professional football was viewed with suspicion for some time after. The first contest had seen the Bulldogs beat the Tigers 10-5, and saw them made favourites to scoop the second game. 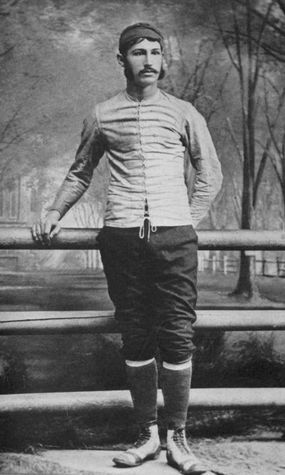 According to many sources, the head coach of the Bulldogs, Blondy Wallace, after having failed to bribe players on the Massillon team, convinced one of his own players to ‘throw the game.’ It appeared Wallace had indeed bet against his team, (proof of which was later shown to Wallace himself) and the Bulldogs did go on to lose 12-6. ​Professional football did manage to survive the ‘Tiger-Bulldogs’ scandal of 1906, but it would be over a decade before a rekindling of interest was shown from the public. On 20th August 1920, the first steps were taken to bringing some much needed order to professional football. It was decided in that initial meeting that the American Professional Football Conference (AFPC) would begin play in September of that year. Less than a month later, on Friday 17th September 1920, on a red hot day in Canton, Ohio, the league changed its name to the American Professional Football Association (APFA). There were representatives from each of the ten teams in the league present. The teams represented four states, with Ohio housing four of the teams (Akron, Canton, Cleveland and Dayton), and Illinois laying claim to three more (Chicago, Decatur, and Rock Island). Indiana boasted two of the teams in Hammond and Muncie, while Rochester were the sole representatives from New York. The teams themselves were known to the league as ‘franchises’ and the fee to own a franchise in the APFA was set at $100. Although no official records were kept in 1920, the Akron Pros were announced as champions in April 1921 as they had topped the ’unofficial’ standings with an 8-0-3 (Won-Lost-Tied) record. The following season, the Chicago Staleys (soon to become the Chicago Bears) were crowned as champions of the APFA as they won nine games, losing only once and tying on another occasion. During the APFA’s first two years however, there was no official scheduling and there was still a suggestion of anything but professionalism. ​Prior to the 1922 season, the league was reorganized, with much of the credit going to the Chicago Bears’ owner, George Halas – the father of the new league that would become known as the National Football League (NFL). Gradually the NFL began to grow, but still professional football ranked below the college game in the eyes of the vast majority. Halas’ eventual decision to sign college superstar, Harold ‘Red’ Grange, almost as soon as he had finished his final college game for Illinois University in November 1925, and then embark on a mammoth tour of the United States with his prize signing was seen by some as the first tentative steps in truly establishing professional football in the American conscious. Grange stood alongside the likes of Babe Ruth in the 1920’s as one of the most heralded figures in America’s “golden age” of sport. He was a three time ‘All-American’ at the University of Illinois between 1923-1925. While there, he scored 31 touchdowns and ran for 3637 yards in three, eight game seasons. He signed with the Chicago Bears on Thanksgiving Day 1925 and almost immediately set out on the gruelling 19-game, 66-day tour of the United States. This was to become a turning point of sorts that brought the NFL to the masses, with many fans coming out in droves to see their hero. ​The sixty-six day tour of the United States is regarded as the tour that made pro football. 73, 000 fans packed into the Polo Grounds in New York on 6th December 1925 (the fifth game of the tour) as Chicago downed the Giants, 19-7. Grange returned an interception 35 yards for a touchdown. His unique style of running through and around would-be defenders earned him the nickname ‘The Galloping Ghost‘. Against Pittsburgh on 10th December 1925, Grange was forced to retire hurt after only ten plays. The Bears went on to lose 24-0. Grange played hurt for the next two games but Chicago suffered two more shutout defeats. When he returned healthy on Christmas Day, Chicago celebrated a 7-3 victory over the Miami All-Stars. They lost only one more game on the tour. 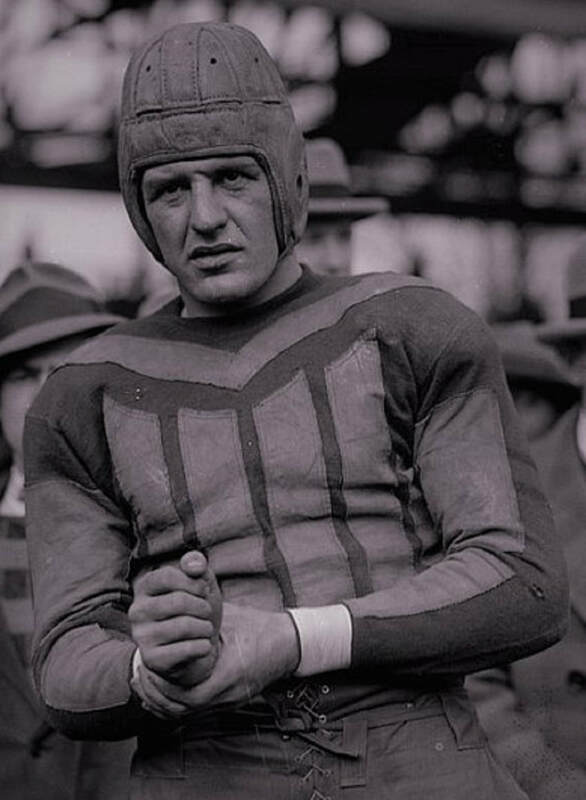 Harold "Red" Grange - the person who "saved" professional football! His tour of the United States in 1925-26 would sow the seeds of what turned into the thirst for the NFL we see today! It is said that following the tour, Grange’s agent, C.C. Pyle (also known as Cash and Carry Pyle) had demanded ludicrously high amounts of money for the Bears to retain his clients services for the rest of 1926, something the Bears refused to do. 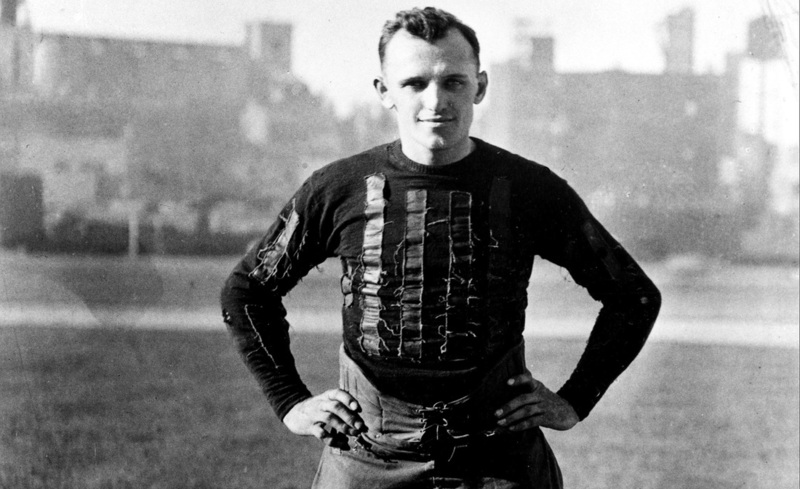 Pyle took his star player to New York and, as he probably had fully intended to do all along knowing the Bears would simply not pay the amount of money he had demanded, set up his own professional football league, the American Football League. Pyle’s own team (the New York Yankees) signed Grange and the new league consisted of nine teams in all; the Yankees, Boston Bulldogs, Chicago Bulls, Cleveland Panthers, Newark Bears, Philadelphia Quakers, Los Angeles Wildcats, and Rock Island Independents. The American Football League was nothing short of a flop however and ceased to exist after only one season. By 1932 the NFL itself had shrunk to a mere eight franchises (Chicago Bears, Green Bay Packers, Portsmouth Spartans - later to become the Detroit Lions, Boston Braves - later to become the Washington Redskins, New York Giants, Brooklyn Dodgers, Chicago Cardinals, and the Staten Island Stapletons) - the lowest number the league has ever harboured. This was in part a result of the Depression that had gripped and seized America throughout much of the thirties. Many of the smaller towns that had relied so heavily on its industry had simply folded and with them their teams. ​That year however, the first ’championship’ game was contested, although it was not officially recognised as such. Based on scheduled regular season games (some teams also played games outside of scheduled matches) the Chicago Bears and the Portsmouth Spartans finished tied for first place in the NFL standings. An extra game was hastily arranged for the two teams to decide who would be crowned champions. Due to the heavy snow however, the contest was to be played indoors at Chicago Stadium. 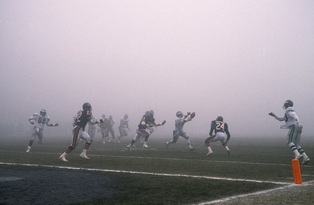 It was the first time a NFL game had been played indoors. The field measured only 80 yards in length however, and the goalposts were moved from the end-line (the back of the end-zone) to the goal-line. Hashmarks were also set up ten yards in from the edge of the field to determine where the ball would be put in play. Despite these hasty changes the game went ahead with the Bears coming out on top 9-0. 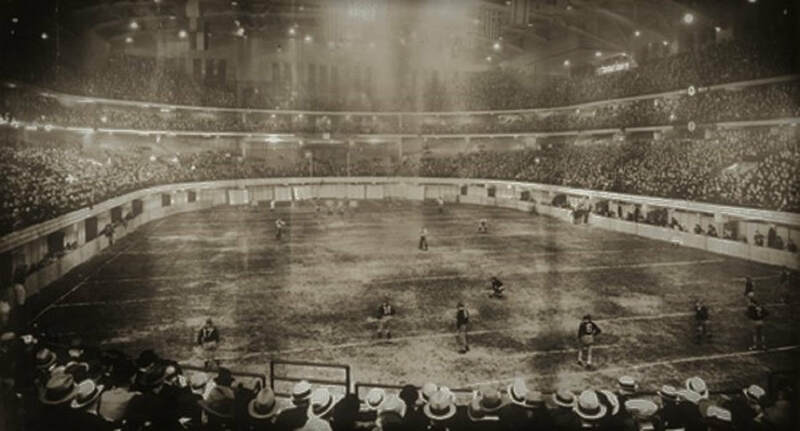 The first NFL Championship game was also the first indoor game. 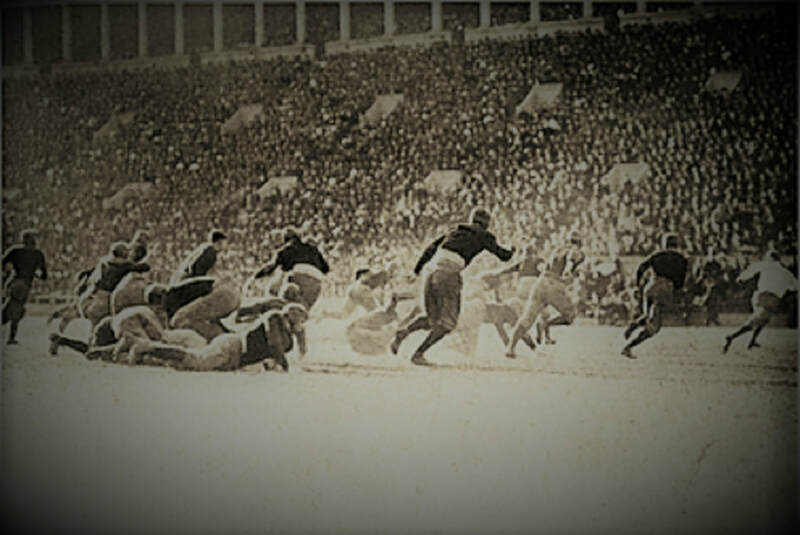 However some of the last-minute alterations - the moving of the goalposts, the hash marks at the sideline as well as a championship game itself - were carried over into the 1933 season. The forward pass was also legalised from anywhere behind the line of scrimmage. In a further attempt to distance itself from the college formula, the NFL divided itself into two divisions (called East and West) as opposed to one table, and for the first time each team played the same amount of games during what would be the ‘regular season‘. The winners of each division would meet in a championship game at the end of the season. The Bears, who won the West division, defended their title with a 23-21 victory over the Eastern division champion New York Giants in the first official NFL Championship game at the end of 1933. ​The NFL was starting, albeit slowly, to mould itself into something vaguely familiar to the incarnation that most fans today see it. Make sure you check out the videos below. They feature various clippings from the 1920s and 30s which give a great idea as to how the game looked in its tentative beginnings. In this On The Sideline featured article we take a look at the Monday Night Miracle, a Monday Night Football game from week 8 of the 2000 season that saw the Miami Dolphins and the New York Jets do battle in one of the wildest contests ever. We take a look at whether the early 1980s Washington Redskins teams have been short-changed somewhat in terms of their place in history in Riggins, Theismann, The 1983 Redskins And The Sunday Afternoon That Ruined Their Legacy our On The Sidelines featured article. For UK NFL fans the Washington Redskins will have a place in their hearts - they were the first Super Bowl winner Channel 4 brought us back in 1982.